Now to today's dish, it can be prepared in under 20 minutes and goes well with Rasam / Sambhar / Kuzhambu + rice (yes, Sambhar and Kuzhambu are different for a Southie, but more on that another day!) . 1) Peel the plaintain stem and chop into rings about 1/4 inch thick. 4) Meanwhile soak the moong dal in warm water for about 10 mins. 5) Pressure cook the veggie and moong dal with very little water & a pinch of turmeric for 2 - 3 whistles. Cool and drain any water. If not using pressure cooker, boil till the dal turns slightly done but not mushy. Add a pinch of salt too. 6) In a pan, heat oil. Prepare the tempering. 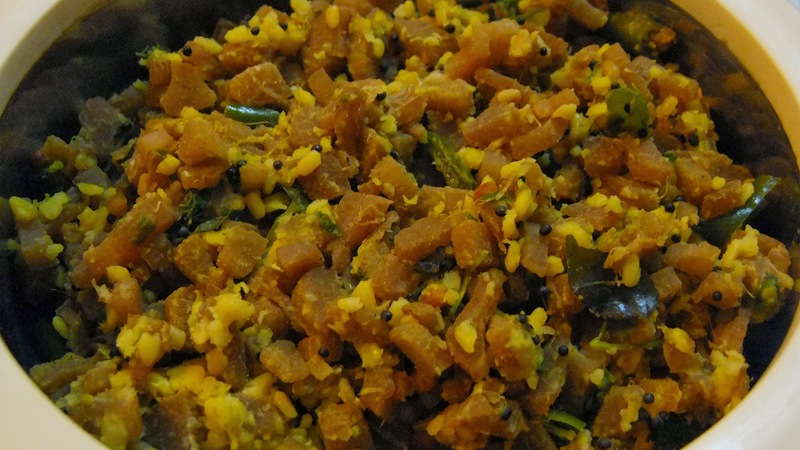 Add the above veggie-dal mixture, curry leaves, salt, grated coconut, coriander leaves and stir lightly. I too would love to have vazhai thandu almost everyday.. Mix with some yogurt I wont even want lunch... I dont get it in US where I live.. I so miss it... You could send to my event..
Miss this vegetable here .. love the porial Kalyani.